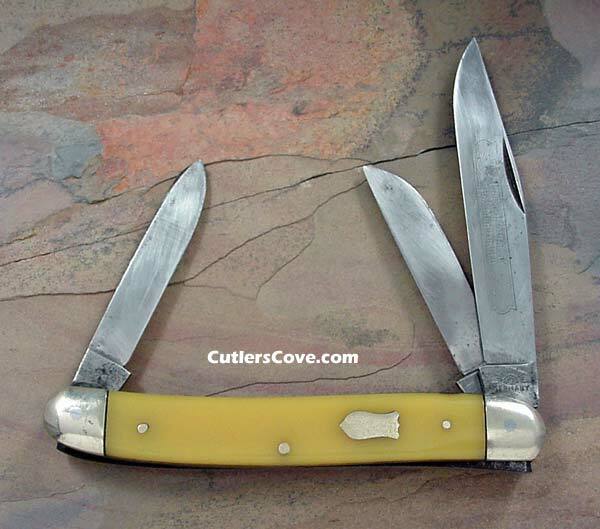 Eye Brand Carl Schlieper German large stockman with yellow handle that is excellent and carbon steel. 4-5/8” closed. Double eye trademark and Premium Quality Hammer Forged on the large clip blade. Clip, spey and sheepsfoot blades. Nickel silver bolsters, brass frame and inlay shield. The knife has been carried and sharpened but has not been used up. All the blades have tarnish and very small oxidation spots, but no rust pits. There are many years left in the high quality German carbon steel pocket knife that walks and talks fine. Made in the 1970's. No longer made. The current Eye Brand Carl Schlieper knives are not the same quality as the older 1970's vintage knives and are made in the Boker factory if I understand correctly.